This is a great way of getting a delicious lunch and a lot of goodness into your life. 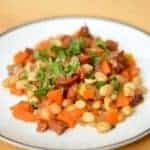 Packed with pulses and vegetables, it works really well if you have people over or are taking it in a tupperware tub to work. Start by prepping everything you need. Drain and rinse the haricot beans, dice your onion quite finely, likewise the celery. Chop your chorizo into little chunks – I tend to make pound coin-sized discs and quarter those. Pop your chorizo into a medium-sized pan and put it on a medium heat. Let it heat up until the orange oils start coming out of the chorizo. Put your bay leaves in at this point and let them fry a little in the oil. If your chorizo hasn’t released much oil, add in half a tablespoon. Add the onion, celery and paprika. Stir to coat and put the lid on. Let it cook gently for about ten minutes, stopping to stir it every two or three minutes. Once softened, add in the haricot beans and stock. Bring it up to a simmer and let it cook for about five or six minutes. Transfer to your serving dish and add a generous amount of black pepper and then shred some parsley over the top. Serve straight away or allow it to cool and then pack it up for lunch the next day.